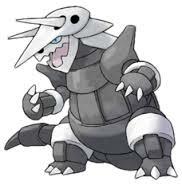 Aggron digs tunnels by using it’s steel horns to burrow through bedrock. It digs the tunnels while seeking iron for food. Possible Moves:Tackle,Harden,Mud-Slap,Headbutt,Metal Claw,Iron Defense,Roar,Take Down,Iron Head,Protect,Metal Sound,Iron Tail,Autotomize,Heavy Slam,Double-Edge,Metal Burst.